About this Virtual Run: An estimated 100 million sharks are killed every year with fins from up to 73 million used for shark fin soup, primarily to supply the market in Mainland China. Some shark populations have declined by up to 98% in the last 15 years and nearly one third of pelagic sharks species are considered threatened by the International Union for the Conservation of Nature. 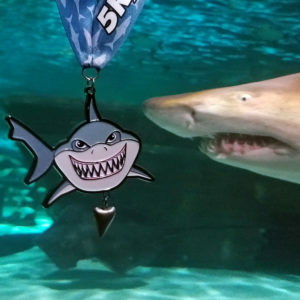 SHARK TOOTH FOSSIL SWEEPSTAKES: 10 of the medals will have a 5 million-year-old wire wrapped shark tooth fossil attached instead of a metal charm. Anyone who receives a winning Shark Tooth Fossil medal will also win a Virtual Strides medal hanger and a $50 Gift Card! Winning Shark Tooth Fossil medals will be randomly distributed throughout the race period, following our standard shipping schedule. Found a Shark Tooth Fossil? Fill out the Shark Tooth Fossil Prize Claim Form by 11:59 p.m. EDT on September 30, 2016 in order to claim your prizes! For complete contest rules and details, please read the Official Rules. A portion of the proceeds from this virtual race (at least $5 from each registration) will be donated to WildAid. For more information about this charity or to make a direct contribution, please visit WildAid.org.